theWord (aka "In The Beginning Was The Word") is a Bible study tool. 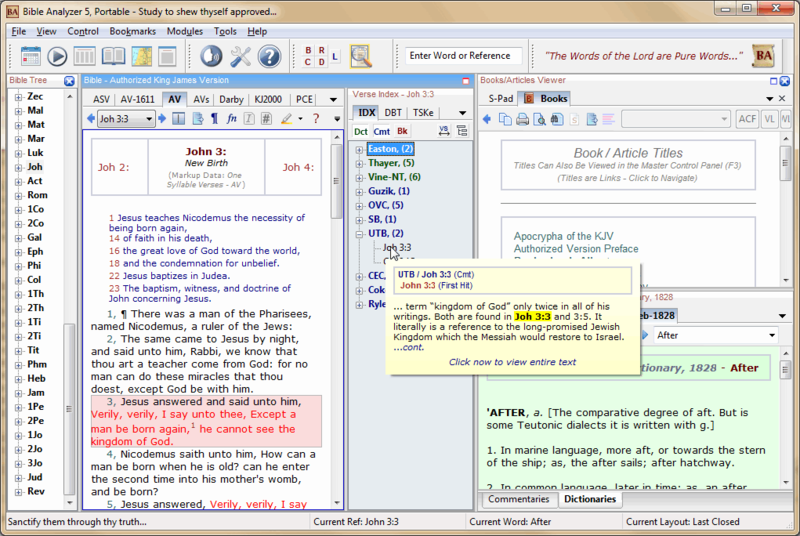 Among the many features: Multiple Bible translations; configurable and fast search engine; parallel Bible view; multiple Bible views/windows; unique Clipboard monitoring function; multiple ways to navigate; personal notes in several levels; verses' bookmarks. 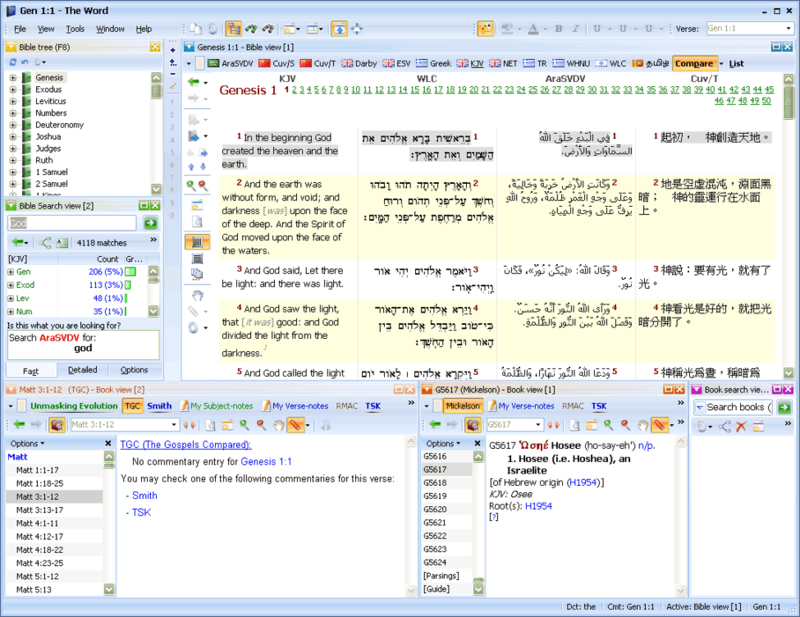 The program handles several versions of Bibles in Original version, Latin, Arab, Bulgarian, Chinese, Dutch, English, French, German, modern Greek, Portuguese, Spanish, Romenian, Russian, Vietnamese, etc. Note: The size of the application significantly depends on the installed Bible versions. Please visit www.theword.gr to get the newest version 3.0.7.901. You no longer have to use Universal Extractor. The Regular installer now has a compact option. Hi, I am a long time user of theWord (esword before that), and I also use MySword for Android apps. I would just like to say that there is a USB form of installation, and that can be done into a folder on any Windows computer. I have probably 25-30 different installations of theWord like this. I do development of modules for theWord, so I have different setups like this. This is TRULY "portable"! Secondly I would like to say that some of the other portable software that I have used before has a lot of "down sides" to it. Most notably is that as Windows goes through generation of generation of operating systems, Windows itself has no loyalty to its own requirements and past operating systems. I once had all my IRS accounting in files in a portable program called Lucid. With time, I finally went back to look up something to find that the portable version of the software no longer works under recent Windows. AAAAAAH! All my records locked away forever! theWord is being actively updated for each modern version of the Windows operating system. On another note, some 10 years ago I got a cheap Toshiba laptop (I think I paid $20 for it), and it had a 286 processor on it. Okay, so it was a waste of time. No ports to speak of except a "modern" USB (at its birth I guess that may be true). It had like 640K of Ram, and something like 500MB of hard disk space. (I probably got ripped off really for $20). But my point here is that I decided to put theWord portable to the test. I got a 4GB USB, yes it would read and write to it. Then I installed theWord portable version on it, and then copied bunches of modules (files in the format theWord uses) onto it. The I cranked it up. To my surpise, theWord worked flawlessly under those primitive conditions. The only real problem was doing searches (which the RAM restriction was the problem, not theWord). But with time, theWord worked perfectly on it. If you want to know how robust this program is, try it on an old junker PC, and you will be surprised! Please visit www.theWordbooks.com to download premium modules. ("30%OFF" code for 30% off until Dec 26, 2016). I also have a website www.twmodules.com for module downloads, as well as a theWord tutorial website at http://www.thewordtutorial.com/. Para español, twmodulos.com para módulos, y http://www.thewordayuda.com/ para ayuda con aprender el programa.